Care homes in Rochdale are helping to tackle loneliness and depression among its residents – thanks to their new pet hens. Cleggsworth House Care Home is just one home that have acquired the animals as part of the Social Hens Homes project, funded by local health and council chiefs, which aims to improve the well-being and social interaction of older people. The initiative has already been deemed successful with residents choosing names for their new furry friends, feeding them, caring for them and helping to collect eggs each morning. 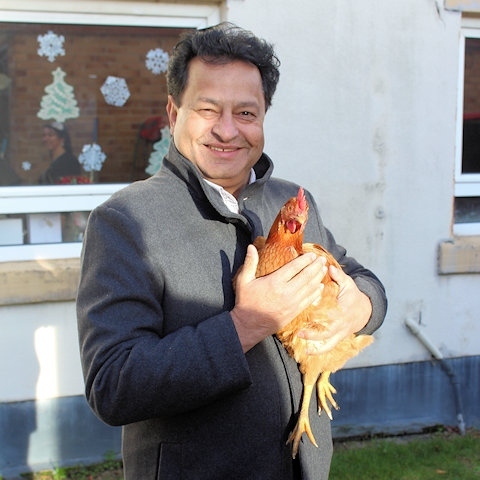 Dr Chris Duffy, chair of HMR CCG and a local GP, said: “The hens are great therapy for the residents at the care home, particularly those with dementia who have benefited enormously from looking after the birds. A number of other care homes in the area are participating in the project and have received an enclosure for the hens along with enough equipment, hay and food to last them a year. The project is organised by Crossroads Together, a Greater Manchester-based charity, and funded by NHS Heywood, Middleton and Rochdale Clinical Commissioning Group’s (HMR CCG) Social Investment Fund. Wendy Estlick, manager of Cleggsworth House, said: “This is a pioneering project that has really helped to improve the health and well-being of our residents.